English cathedrals are often a jumble of architectural styles added at different periods of construction and re-construction. There is also quite a lot of variety, including a number of unusual or unique designs, which make it difficult to trace the evolution in style of England's most important churches. 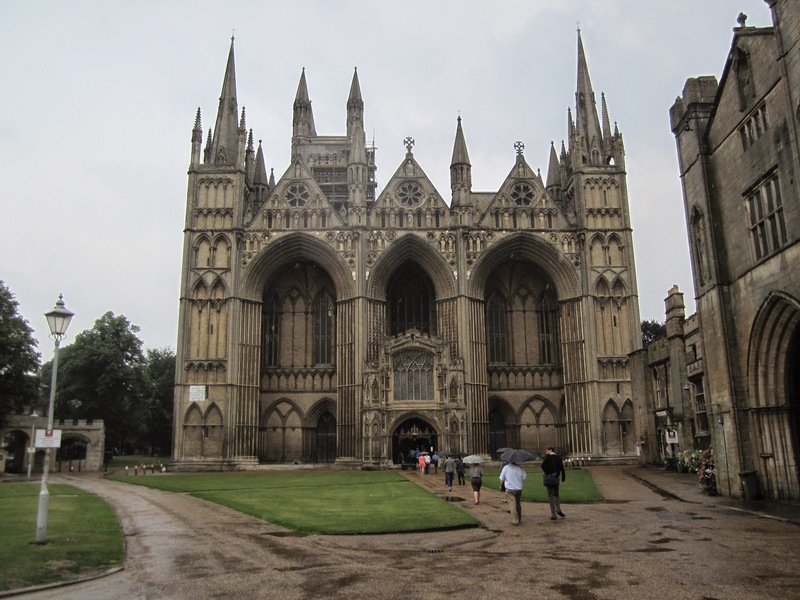 A prime example is the facade of Peterborough Cathedral, which was completed in 1230. Nothing quite like seems to have been built anywhere else. The main feature is a gothic screen that covers the entire west front. The screen is divided into three arches, narrowed in the middle, and is flanked with two turrets at either end. The spires are slightly different and may have been added later given their more decorative style. The central gable is also flanked with turrets. Most of the surface treatment of facade comes from arcading, except in the gables which are covered in statues in niches. There are also circular windows. A porch in front of the main entrance was added in 1375. The previous church was destroyed in a fire in 1116, and most of the new abbey, including the central tower, had been completed by 1193. The Norman tower was rebuilt in gothic style in the second half of the 14th century and a 'new building' with perpendicular fan vaulting was added to the east end in 1496-1508. The original church is thought to have been founded in about 655 and was rebuilt around 966. Peterborough became a cathedral after the dissolution of the monasteries in 1541, when it was separated from the diocese of Lincoln. The lower and central part of the west front of Lincoln cathedral originates with the first building campaign in 1088-92 and may originally have belonged to a freestanding structure, not connected with the cathedral. It was enveloped within a taller and broader facade in the early 14th century. The Norman church had been destroyed in an earthquake in 1185 and the rebuilding went on for most of the 13th century. The central tower had a spire, which it is believed made it the tallest structure in the world until it was blown off in a storm in 1549. The diocese was previously based in Dorchester before the Normans moved it to Lincoln in 1072. The west front of Winchester Cathedral was rebuilt in 1346-66 as the first phase in the transformation of the nave, which was completed in 1367-1404. A gothic retro-choir had been added in 1189 and the crossing tower was rebuilt after the original collapsed in 1107. Otherwise, the cathedral stood as built in 1079-93 and the Norman transepts still survive. Further alterations were made in the 15th and 16th centuries, with the addition of chantries to the retrochoir and the rebuilding of the lady chapel and presbytery. The Norman cathedral replaced two anglo-saxon churches, the Old Minster dating from 1648 and the New Minster from 901. The west front of Ely Cathedral was finished in 1400 when the octagonal tower was completed. The lower parts of the facade were begun around 1140 but the west tower was left half-built around 1189. There were originally transepts on either side of the tower but the north-west wing collapsed at the end of the 15th century. The porch was probably built in the early 13th century. 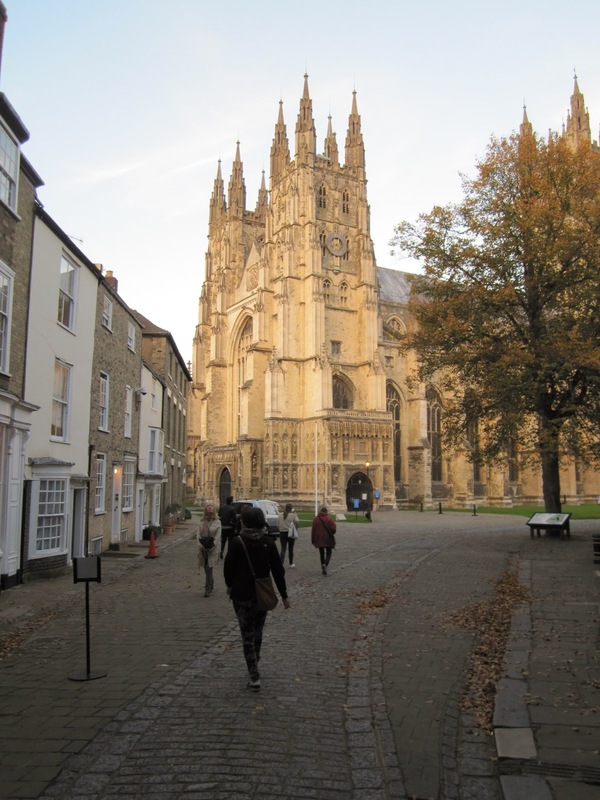 The western front of Canterbury Cathedral is from the early 15th century, with the exception of the north-west tower, where the previous Norman tower remained until 1834. The nave was entirely rebuilt after an earthquake in 1382 and the central tower was begun in 1433. The transepts retain a little more of the Norman church, which was built after a fire in 1067 and which was modelled on Abbey of St. Etienne in Normandie. The choir had already been damaged in a fire in 1174 and rebuilt in gothic style. The church was originally founded in 597 by a Benedictine abbot sent to Britain as a missionary by the pope. The church may have predated his arrival and was replaced with a new structure in the ninth or tenth century. The west front of Norwich Cathedral is a hybrid between Norman and Perpendicular, with a few 19th-century alterations added to the mix. The original Norman features are primarily on the fronts of the aisles, including the pre-gothic semi-circular arches and the flanking turrets. However, there is a mis-match between the blind arcades above the side entrances, which are also not quite identical. Pointed gothic arches suggest a later alteration was done to the front of the south aisle. The nave portion is flanked by buttresses that appear to be original, but the entrance is from the first half of the 15th century and the traceried central window was inserted in about 1449. Construction of the cathedral first began in 1096, after the East Anglia diocese was moved from Thetford. It was completed by 1145. St. Paul's Cathedral is the Anglican cathedral of London, designed by Christopher Wren in 1668-1711, though some of the statues on the roof were only added in the 1720s. For more information, click here. Southwark Cathedral only became a cathedral when the diocese of Southwark was created in 1905, though a church may have existed here since before the Norman invasion. Most of the building as it stands is from after the fire of 1212, and construction probably lasted for much of the 13th century. The tower was completed around 1420 and some rebuilding also took place after a fire in the 1390s. Most of the east front is from 1808-30, due to a restoration by George Gwilt Jun. He removed the windows that had been added in the early 16th century but there was no record of how it had looked before and the restoration therefore resulted in a new gothic design. The west front of St. Albans Cathedral was built in 1880-83 to a design by Edmund Beckett. The medieval structure had fallen into serious disrepair and went through extensive restoration work throughout the 19th century, but it still retains features from the Norman abbey built in 1077-89. This includes the central tower and parts of the nave. The nave was extended in the 1190s and the western front as restored by Beckett originates from that period, though the large west window was only introduced in the 15th century. The eastern end was rebuilt after an earthquake in 1250 and parts of the nave suffered the same fate after it collapsed in 1323. 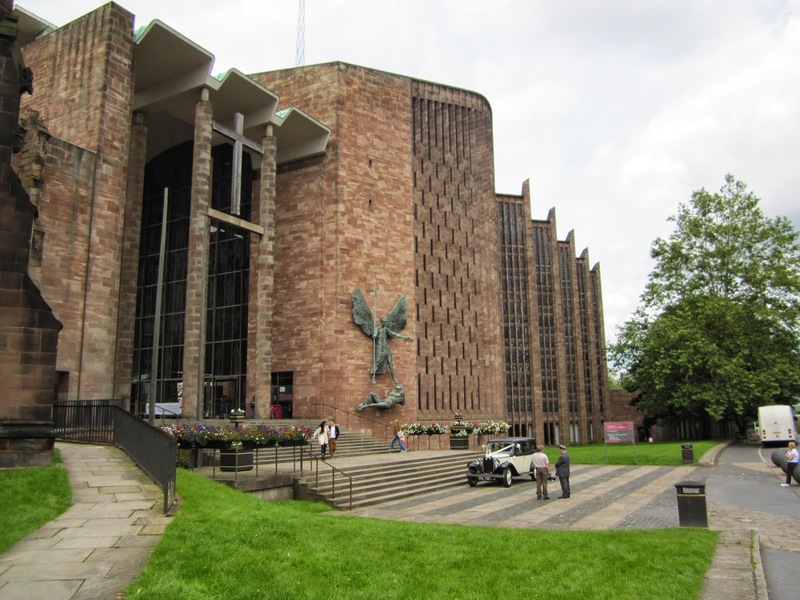 St Micheal's Cathedral in Coventry was built in 1956-62 to a design by Basil Spence and Arup, next to the ruins of the former 14th-century cathedral. The design was chosen in a competition held in 1950. 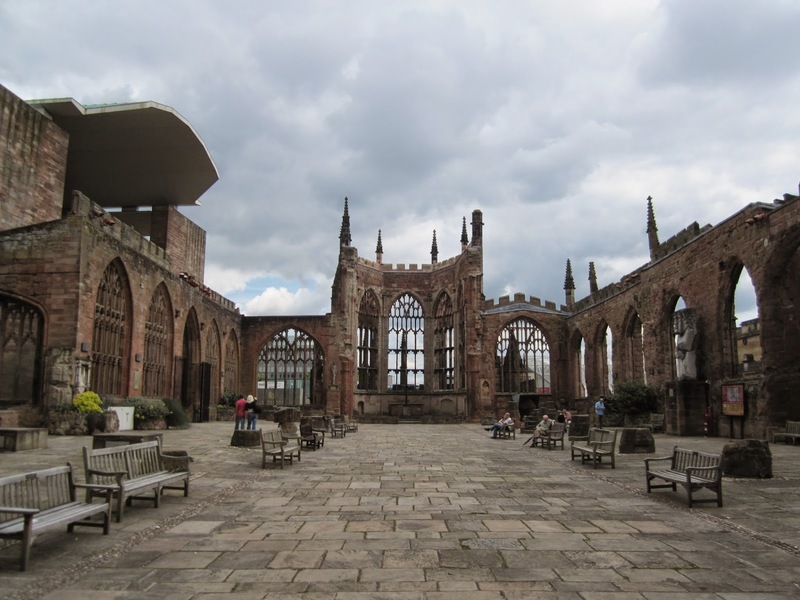 St. Micheal's Church in Coventry was elevated to cathedral status in 1918 by the creation of the Coventry diocese. The church was built in the 14th century and completed in the early 15th but was reduced to rubble during the blitz. Only the tower and outer walls remain.